What Kinds of Doctors Treat Stroke? Do you have questions about a possible Cervical Artery Dissection case? Contact us now using this confidential form or Call Us At (800) 674-3082. We'll help you get answers. A cervical artery dissection can be caused by stroke malpractice or can be made worse by stroke malpractice. A cervical artery dissection is a medical emergency. It is negligent for a hospital not to have a protocol to transfer stroke patients. Doctors and hospitals must be equipped to quickly diagnose and treat cervical artery dissections. If the hospital and doctor are not equipped to treat the cervical dissection, they must immediately transfer the patient to a comprehensive stroke center where appropriate treatment can be provided. Any unnecessary delay in diagnosing and treating a cervical artery dissection may be medical malpractice. Why is a Cervical Artery Dissection Dangerous? How Often Do Cervical Artery Dissections Occur? What Are the Symptoms of a Cervical Artery Dissection? Are There Different Kinds of Cervical Artery Dissections? What is a Vertebral Artery Dissection? Why Are Vertebral Artery Dissections Dangerous? What are the Signs and Symptoms of Vertebral Artery Dissection? What Causes Vertebral Artery Dissection? How is Vertebral Artery Dissection Diagnosed? How is Vertebral Artery Dissection Treated? What is the Prognosis for Vertebral Artery Dissection? What Are The Medical Malpractice Claims for Stroke Caused by Vertebral Artery Dissection? What Are Some Noteworthy Cases of Vertebral Artery Dissection? What is the Difference Between a Carotid Artery Dissection and a Vertebral Artery Dissection? What Are The Symptoms of A Carotid Artery Dissection? How is a Carotid Artery Dissection Diagnosed? What is the Treatment for a Carotid Artery Dissection? What are the Possible Medical Malpractice Claims for a Carotid Artery Dissection? How Do I Hire You to be My Cervical Artery Dissection Malpractice Lawyer? Arteries carry blood away from your heart to the rest of your body. You have two pairs of large arteries on each side of your neck. You have two carotid arteries and two vertebral arteries. These arteries carry blood to your brain. The vertebral and carotid arteries are partially within the skull and outside the skull, making them vulnerable to injury. A cervical artery dissection occurs whenever you have a tear in the wall of one of these large arteries (vertebral or carotid) that carries blood to the brain. 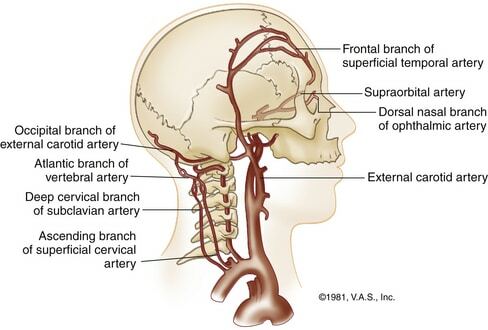 A cervical artery dissection is a tear in one of the arteries that goes to the brain. Surprisingly, it’s not the tear itself that is usually dangerous. It’s the clot that forms in an attempt to “heal” the tear that is often dangerous. Whenever your body is injured from a cut, your blood starts to coagulate or clot to stop the bleeding. Your body is trying to heal itself. When your body attempts to do this in an artery, the clot slows blood flow to the brain. 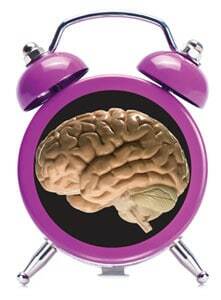 As soon as blood is not getting to the brain, the brain tissue begins to die. This is called an ischemic stroke. Ischemic strokes are the most common types of strokes. One way to think of this is by imagining a clogged drain in a sink. When something gets caught in the drain, more and more debris start to pile up. Over time, the clog gets bigger. This prevents water from draining where it should. A similar thing happens when you have a cerebral artery dissection. Initially, there is a small tear in the lining of the artery. As a small blood clot begins to form, more and more blood collects creating a larger clot. When we are talking about arteries, we are dealing in millimeters. Even the largest arteries to the brain are only a matter of millimeters. This means that it does not take a large blood clot to cause serious problems. Without immediate treatment, a person with a cervical artery dissection can die or suffer permanent injuries. Doctors must immediately recognize the signs and symptoms of a cervical artery dissection and aggressively treat it to prevent serious injury or even death to the patient. If a doctor or hospital should have realized that a patient was suffering a cervical artery dissection and misdiagnosed the stroke, delayed in diagnosing the stroke, or delayed in treating the stroke, the doctor and hospital were negligent. If this happened to you or someone you know, you should contact a stroke a stroke malpractice lawyer. Cervical artery dissection is one of the most common causes of stroke in people under the age of 50. There are two types of cervical artery dissection: (1) carotid artery dissection and (2) vertebral artery dissection. Carotid artery dissection is more common that vertebral artery dissection. The two conditions together account for 10–25% of ischemic strokes in young and middle-aged people. If a younger patient has any stroke symptoms, a doctor should consider a cervical artery dissection as a potential source of the problem. The symptoms of a cervical artery dissection can be vague and wide-ranging. It depends on which artery has been affected and how severely, and whether or not you have a stroke as a result. A severe headache is a common sign of a cervical artery dissection. It is important for doctors and patients to remember that stroke symptoms in women and stroke symptoms in children may not include all of these classic signs. All stroke symptoms are a medical emergency. Doctors must treat these stroke symptoms as a medical emergency. There is no reason for a doctor to ever delay making the correct diagnosis when it comes to stroke. A vertebral artery dissection is a tear to the lining of the vertebral artery. When the tear occurs, blood enters the tear and forms a blood clot. The clot grows in size and prevents blood from flowing to the brain. About 75% of the vertebral artery is outside of the skull in the neck. The vertebral artery is susceptible to traumatic injury. This is because it is outside the skull and because it runs along an area of the neck that rotates from side to side. When you twist your neck from side-to-side, you are also rotating your vertebral artery. Because of this, the vertebral artery is vulnerable to traumatic injury from sports, car accidents, falling, “whiplash” injuries, yoga, and chiropractic manipulation. In fact, a large number of vertebral artery dissections are actually caused by chiropractors manipulating a patient’s neck from side-to-side to roughly and without warning the patient of the risks. Most dissections happen in the neck just below the skull. These occur between the first and second bony plates in your spine called vertebrae. Because this is where the dissection occurs, it is where the initial clot forms. When the vertebral artery enters the skull, it merges with other arteries that provide blood to the brainstem. The brainstem controls breathing, the ability to move your arms and limbs, and many other vital functions. 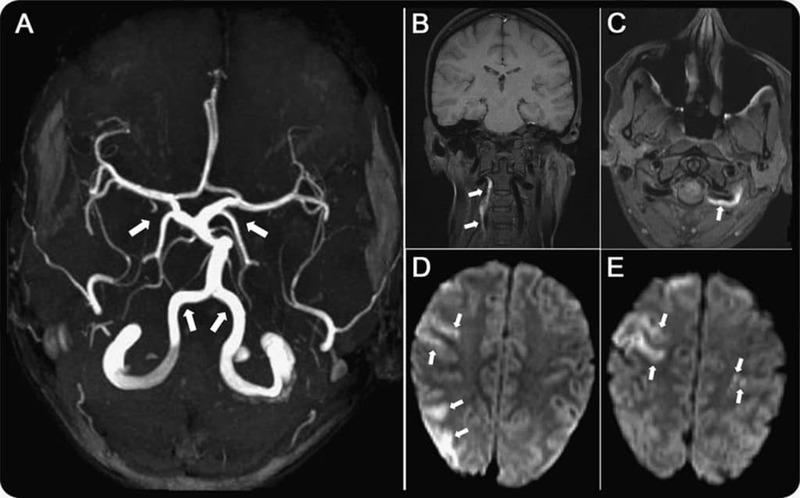 When a clot forms from a vertebral artery dissection, it can prevent blood from flowing to the brain stem causing permanent deficits, death, or even a condition known as locked in syndrome where a person is basically from frozen but is aware of what is going on around him or her. 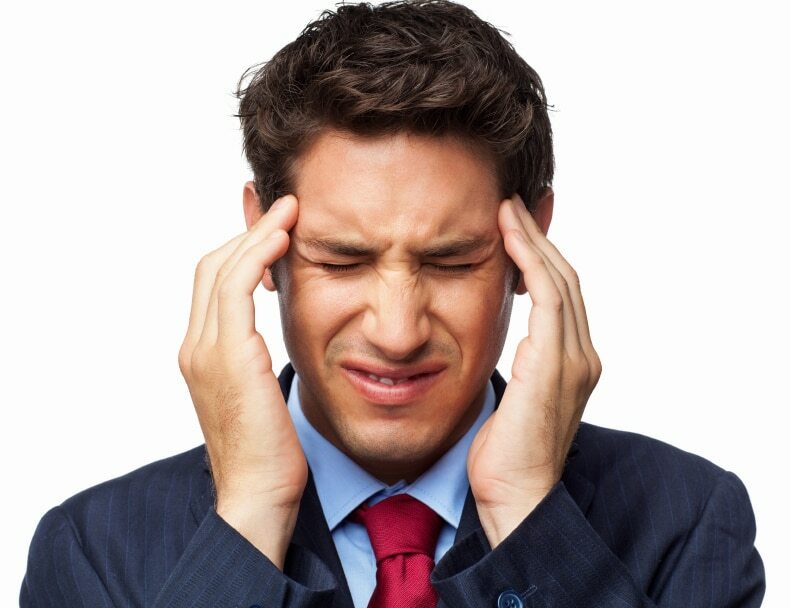 Head pain – This occurs in 50–75% of all cases of vertebral artery dissection. It tends to be located at the back of the head, either on the affected side or in the middle, and develops gradually. It is either dull or pressure-like in character or throbbing. For some people, headache is the only symptom of vertebral artery dissection. About 8% of all people who are diagnosed with either vertebral or carotid artery dissection are diagnosed on the basis of pain alone. Stroke Symptoms – Around 77-96% of people diagnosed with a vertebral artery dissection experience dysfunction in part of their brain. These stroke symptoms may be temporary (called transient ischemic attacks or TIAs). Other people have permanent deficits from an ischemic stroke. Many people have dissections or torn arteries on both sides of the body. This means that unlike classic stroke signs—which occur only on one side of the body—a person with a vertebral artery dissection may experience signs or symptoms on both sides of the body. The causes of vertebral artery dissection can be grouped under two main categories, spontaneous and traumatic. Some vertebral artery dissections occur spontaneously, meaning they happen without any trauma at all. There are various theories about why some people develop vertebral artery dissections spontaneously. Regardless of whether the dissection is spontaneous or caused by trauma, doctors must recognize the problem quickly and act appropriately. If a doctor delays diagnosing or misdiagnoses a vertebral artery dissection and it causes a stroke, it is likely medical malpractice. Traumatic vertebral artery dissection usually follows trauma to the neck. This trauma can be major but is often minor trauma. It is not unusual for people to suffer traumatic vertebral artery dissection from only a slight injury. Anything that causes sudden neck movement can cause a vertebral artery dissection. In most cases of vertebral artery dissection—as many as 90%—the trauma is reported as being minor. As you can imagine, patients who suffer vertebral artery dissections are often young, healthy, and active. This is not a group of people we commonly associate with having strokes. Doctors, however, should know that young people—including those who are active—are at risk of suffering strokes from cervical artery dissections. Doctors must take all reports of head and neck injuries seriously. If a patient reports head or neck trauma or any signs of a vertebral artery dissection, the doctor must take steps to diagnose a stroke. If a doctor misdiagnosis the stroke or delays diagnosing the stroke, the patient can suffer a lifetime of preventable suffering or even death. In such a case, the doctor may have committed medical malpractice relating to the stroke. A lawsuit may be the only option for the family. Imaging of the head and neck is the only accurate way to diagnose a vertebral artery dissection. If a patient has signs of a vertebral artery dissection, doctors must perform these tests. It is the only way to immediately confirm the diagnoses. If doctors suspect that a patient has a vertebral artery dissection and they do not order imaging to confirm the diagnosis, it is medical malpractice or negligence. If that has happened to you or a loved one, speak to a medical malpractice attorney dedicated to stroke immediately. Your life may depend on what hospital treats your stroke. A doctor must order treatment for a vertebral artery dissection. If a doctor or hospital diagnoses a stroke—whether from a vertebral artery dissection or other cause—and does not treat the condition or delays treating the condition, it is negligence and medical malpractice. In such a case, it is important to talk to a medical malpractice attorney who dedicates his or practice to stroke. The outcome for young patients who have had a vertebral artery dissection is the same for any kind of stroke. With good medical treatment, about 75% of patients will recover with no functional problems. If antiplatelet drugs are used for the stroke, about 85% will recover with no functional problems. If patients receive bad or negligent medical care, they can suffer severe functional difficulties or even death. For more information about life after stroke, click here. Stroke from chiropractic neck manipulation occurs when an artery to the brain ruptures or becomes blocked by a clot as a result of being stretched. The injury often results from extreme rotation in which the chiropractors hands are placed on the patient’s head in order to rotate the cervical spine by rotating the head. Chiropractors can cause strokes by manipulating the neck. The vertebral artery is vulnerable because it winds around the topmost cervical vertebra to enter the skull, so that any abrupt rotation may stretch the artery and tear its delicate lining. Chiropractors would like you to believe that the incidence of stroke following neck manipulation is extremely small. Speculations exist that the risk of a serious complication due to neck manipulation are somewhere between one in 40,000 and one in 10 million manipulations. No one really knows, however, because (a) there has been little systematic study of its frequency; (b) the largest malpractice insurers won’t reveal how many cases they know about; and (c) a large majority of cases that medical doctors see are not reported in scientific journals. A stroke is a medical emergency. Neurologists use the phrase, “time lost is brain lost” to emphasize how critical fast diagnosis and treatment are to saving brain cells. All doctors should know how to diagnose a stroke or immediately refer a patient to a doctor or hospital that can treat the stroke. If a doctor delays treating or diagnosing a stroke, it may be medical malpractice. No matter the type of stroke, once it occurs, brain cells begin to die and brain damage occurs at a rapid rate. When brain cells die during a stroke, the sensory and motor abilities controlled by that area of the brain are lost and are (almost) never fully recovered. These abilities include speech, movement, memory, and other cognitive functions. They can also include more primitive functions like breathing and swallowing. If a doctor commits an error by misdiagnosing a stroke or delaying the diagnosis of a stroke, it is medical negligence. The patient (or the patient’s family if the patient has died) can bring a medical malpractice lawsuit related to stroke or a wrongful death lawsuit related to stroke. If this has happened, it is time to talk to a stroke malpractice lawyer. Once a stroke is diagnosed, treatment must be implemented immediately. It is not enough to prescribe some treatment, a doctor must prescribe the right treatment for the type of stroke at issue. When it comes to treating stroke, not all doctors are the same and not all hospitals are the same. Some hospitals are more equipped to handle stroke than others. These hospitals are called comprehensive stroke centers. 34-year-old model and internet sensation Katie May died in February 2016 days after a chiropractor manipulated her neck. Sadly, May had no idea that the head and neck pain she was experiencing days after going to a chiropractor were the signs of a vertebral artery dissection and stroke. She continued to complain of the head and neck pain. She even went back to the chiropractor for additional adjustments in the days before her death. Click here for more information about Katie May’s death and the pending wrongful death lawsuit. Phillip Hughes, a professional cricket player in Australia died from a vertebral artery dissection. Hughes was struck in the neck at the base of his skull near his ear. The impact from the ball caused a vertebral artery dissection. Hughes injuries were complicated by the fact that he also had a subarachnoid hemorrhage. Canadian freestyle skier Sarah Burke died after suffering a vertebral artery dissection. Burke was a six-time Winter X Games medalist and winner of the Women’s Ski Superpipe in 2011. She was preparing to defend her title at the Winter X Games when she fell and hit her head and neck. 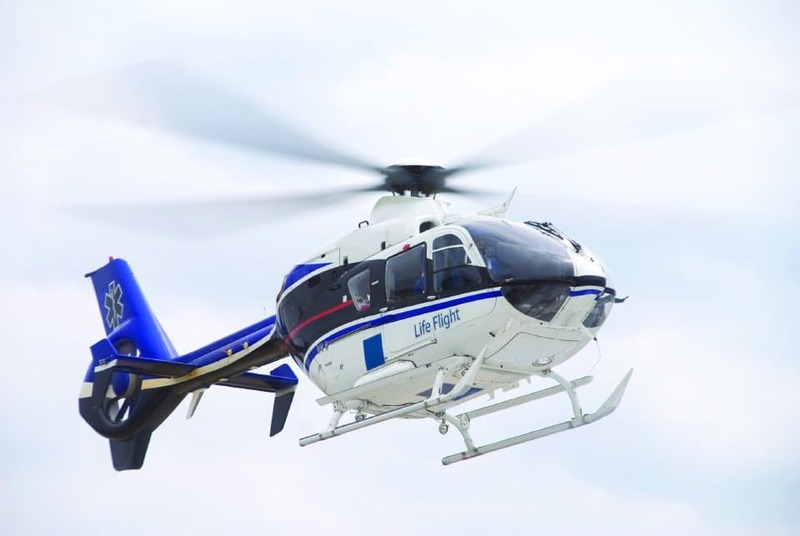 While she initially appeared normal, she soon went into cardiac arrest. Tests showed that she suffered a vertebral artery dissection. The tear was repaired by a neurosurgeon, but she died after 9 days in the neurointensive care unit. Actress Claudia Mason suffered a vertebral artery dissection after whipping her head around during a dance class. She had neck soreness following the routine. Little did she know at the time, but this was a sign of a vertebral artery dissection. As the body attempted to “heal” the small tear, it formed a blood clot causing an ischemic stroke. Fortunately, Mason was appropriately treated in time and recovered from her stroke. Carotid arteries are blood vessels that carry oxygen-rich blood to the head, brain, and face. They are located on each side of the neck. You can easily feel them by placing your fingers gently on either side of your windpipe. When the wall of one the carotid arteries is torn, it is called a carotid artery dissection. The difference between a carotid artery dissection and a vertebral artery dissection is which artery is torn. When the vertebral artery is torn, it is called a vertebral artery dissection. When the carotid artery is torn it is called a carotid artery dissection. Both a vertebral artery dissection and a carotid artery dissection are called cervical artery dissections. They are medical emergencies. Carotid dissection may present as a stroke with weakness on one-side of the body, visual disturbance, facial droop, or difficulty with speech. Some patients experience a “whooshing” noise in one ear known as ringing in the ear that is consistent with the heartbeat. Any of these symptoms should prompt an immediate evaluation by a physician. A doctor diagnosis a carotid artery dissection by ordering “imaging.” These tests allow the doctor to look at the arteries in the head and neck. If the doctor or hospital cannot perform these tests, they must immediately transfer a patient to a hospital that can perform. All hospitals are equipped to transfer patients to comprehensive stroke centers. It is negligence for a hospital to delay treatment or diagnosis of a stroke when they can simply order a transfer to a hospital that can. A doctor must order treatment for a carotid artery dissection. If a doctor or hospital diagnoses a stroke—whether from a carotid artery dissection or other cause—and does not treat the condition or delays treating the condition, it is negligence and medical malpractice. In such a case, it is important to talk to a medical malpractice attorney who dedicates his or practice to stroke. The causes of internal carotid artery dissection can be broadly categorized into two classes: spontaneous or traumatic. Some carotid artery dissections occur spontaneously, meaning they happen without any trauma at all. There are various theories about why some people develop carotid artery dissections spontaneously. Regardless of whether the dissection is spontaneous or caused by trauma, doctors must recognize the problem quickly and act appropriately. If a doctor delays diagnosing or misdiagnoses a carotid artery dissection and it causes a stroke, it is likely medical malpractice. The other major cause of a carotid artery dissection is trauma. It is not uncommon for patients admitted to the hospital after a major motor vehicle accident to be diagnosed with a carotid artery dissection. After such an injury, the patient may not have any symptoms, have intermittent stroke symptoms (a transient ischemic attack), or suffer a stroke. If you would like us to begin investigating your case, there are a number of ways to begin. You can always call us at 216-777-8856. You can also enter your information into the contact information form at the bottom of the screen. You can also enter your information into the chat box that appears on the screen. If you prefer to text, you can click the text us box from your mobile device. As you can imagine, lawyers who concentrate on stroke are in high demand. We are contacted by potential clients, other attorneys, and even doctors from across the country asking us to help with their cases. We would love to take every case, but we simply cannot. We can only take those medical malpractice cases that have strong merit. These are cases where a doctor or hospital error clearly caused a stroke or made the stroke much worse. Once we have investigated your case, we will candidly tell you the results of our investigation and why we may or may not be the best lawyer for your stroke medical malpractice case. If for whatever reason we do not take your case, and we think there is some merit to the case, we’ll try and help you find a lawyer who is the best fit for your stroke medical malpractice case. If you would like more information about us, you can always us visit us at Eadie Hill Trial Lawyers.